A ZephIR 300 wind lidar installed at Dogger Bank (above) for the Forewind consortium has provided data which shows the technology has advanced to the stage where it can be used in future as an alternative to meteorological masts for wind data collection. 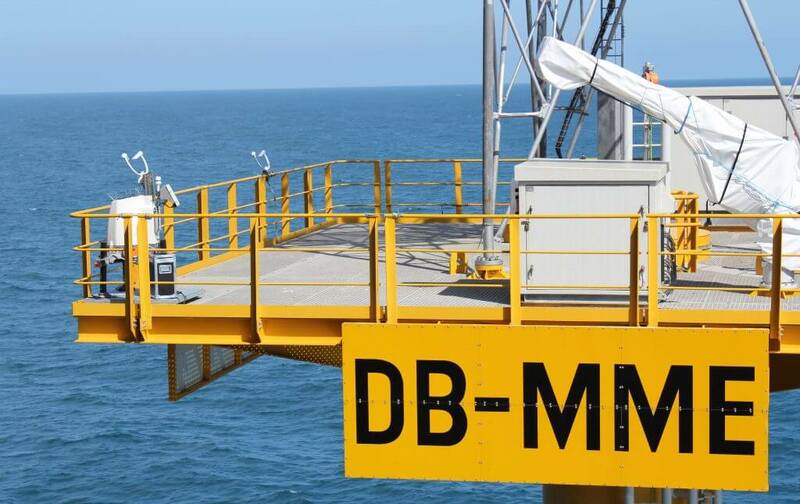 The Dogger Bank projects being developed by the Forewind consortium will have a capacity of 4.8 GW and, as part of their assessment process, two meteorological mast platforms were installed during 2013. In November 2014, a ZephIR 300 wind lidar was installed on the east meteorological mast platform by sister company SeaRoc Group to provide continuous data above the existing mast height, while the mast underwent maintenance works. The lidar collected wind speed information for four months to April 2015 and then when the meteorological mast was reinstalled in May 2015 it continued wind speed measurement at the mast’s base. Results now published confirm the lidar was available for 100 percent of the time and correlations to the met mast were found to be excellent and at least as good as variations between individual cup anemometers. SeaRoc has worked with Forewind since March 2013, managing the complete installation works of both the east mast which is located approximately 81 nautical miles (150 kilometres) from the UK coast, as well as the sister mast to the west. In March this year, SeaRoc collaborated with its sister company to design the installation of the ZephIR Lidar at what is thought to be the furthest offshore lidar deployment in the world. Due to its remote location an extremely reliable and very low maintenance power and communications solution was required. The ZephIR Lidar has the ability to record data from up to 300m high from installed location, right down to just 10m. SeaRoc has now installed three ZephIR Lidars including two for Forewind, this one on the Dogger Bank Met Mast East and an earlier installation on the Cavendish platform in 2011. Visit www.zephirlidar.com for more information. © 2015 Zephir Ltd. All rights reserved. ZephIR, Zephir, ZephIR 300, ZephIR DM, ZephIR Care, ZephIR Power and Waltz are trademarks of ZephIR Lidar. Other company and product names may be trademarks of their respective owners.